Be informed that with sr-niel website version 4.0.0 (September 20, 2018), the sr-niel handbook was emebedd within the same website, i.e., you can access to the updated version at at this link. Welcome to the relativistic screening (SR) treatment handbook Website. In these pages you can find information about physics process regarding the Screened Relativistic (SR) Calculator of the Non-Ionizing Energy Loss of electrons, protons and ions passing through an absorber, generating displacement damages and, in case of semiconductors, introducing deep levels resulting from the Frenkel pairs created. 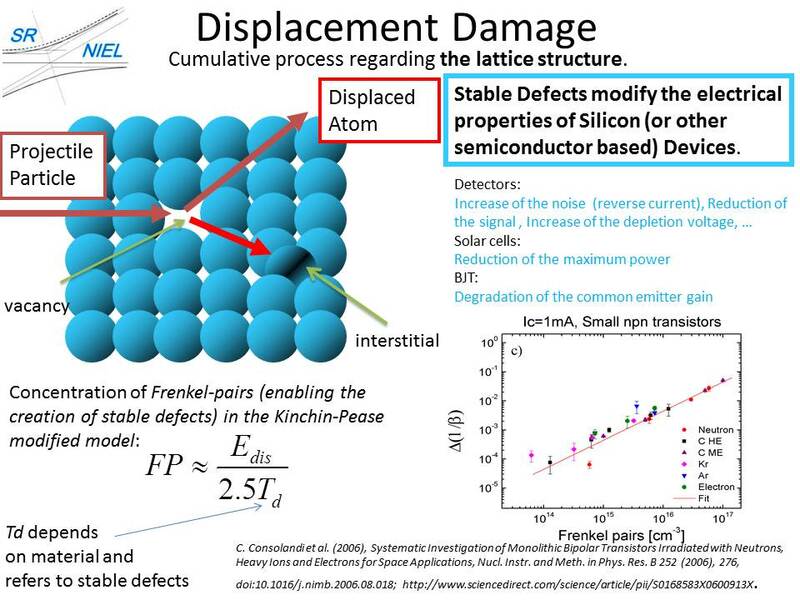 NIEL doses (also termed "displacement damage doses") are also provided. The notation of screened relativistic (SR) NIEL was introduced by Baur et al. (2014). It is treated in Sects. 11.3.1, 11.3.2 of [Leroy and Rancoita (2016)] and Sect. 2 of [Baur et al. (2014)]. 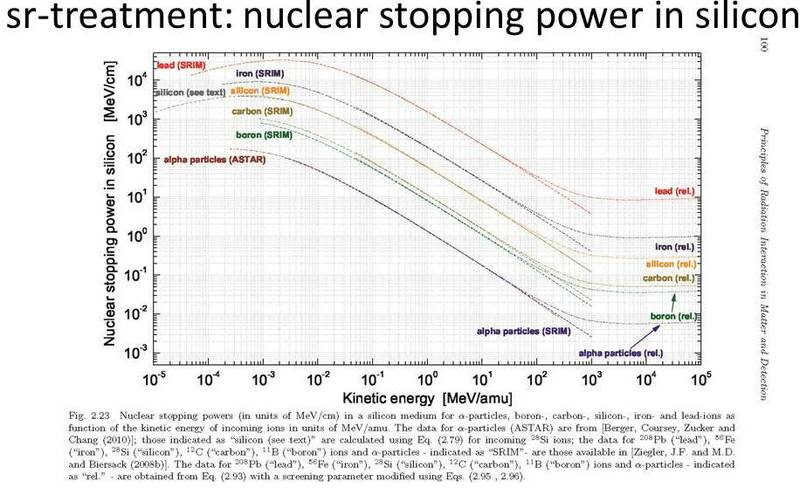 The SR-NIEL is derived from the SR (screened relativistic) nuclear stopping power for electrons (e.g., see Sect. 2.4.3 of [Leroy and Rancoita (2016)]) and the SR nuclear stopping power for massive particle at relativistic energies (e.g., see Sect.2.2.2 of [Leroy and Rancoita (2016)]). Furthermore in the sr-niel website, based on the physics framework here illustrated, an online calculator for the nuclear stopping powers of electrons, protons, light- and heavy-ions is available. 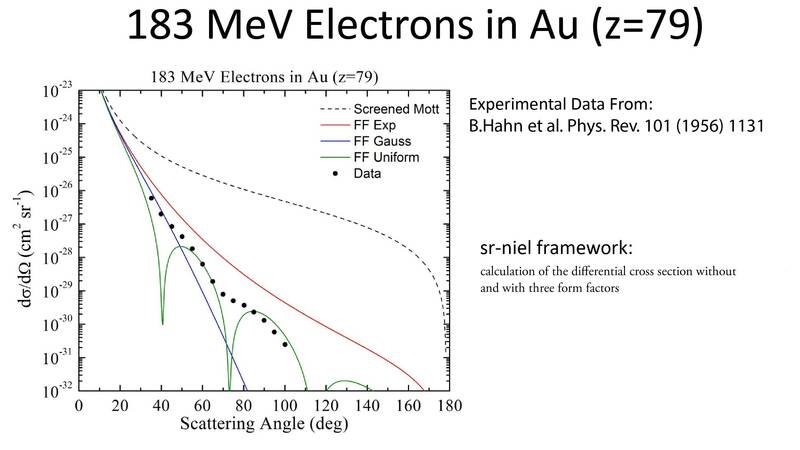 The calculations are carried out based on the screened relativistic treatment for (elastic) Coulomb interactions on nuclei from low up to ultra relativistic energies. In the sr-niel website, a calculator for the probability of generating energetic recoil nuclei is also available. From version 1.5.2, additionally, the estimates of recoil energy fractions deposited via ionizing and non-ionizing processes are accessible using two of the mostly employed analytical approximations of energy partition function. From version 2.1 the calculator allows one to obtains NIEL values and NIEL doses for neutrons in Si and GaAs absorbers, derived from ASTM-722-09 and ASTM-722-14 standards. - NIEL dose calculators for neutrons and neutron spectral fluence in some elements (C, N, Si, Ga, As, from version 3.5.1 0, Al, P, In, Cd, Te, Ge, Zn, Se, Sb, from version 3.9 Cu, Hg, Pb, S, Sn, from version 3.9.2 B, Bi, Cl, Tl and from version 4.5.0 also Li, Ti, Mn, Br, Sr, Nb, Mo, Ag, I, Ba, La, Eu, U) and their compounds, using Robinson and Akkerman partition functions. - determination of the Damage Function at 1 MeV for Si and some compounds. The hyperlinks cross-correlation between this website and sr-niel.org website is implemented from its version 3.4.1. At present, in the sr-niel.org website, calculators for ionizition energy losses (and doses) of electrons, protons and ions are also available. A comprehenseve treatment of the screened relativistic physical processes is found in: C. Leroy and P.G. Rancoita (2016), Principles of Radiation Interaction in Matter and Detection - 4th Edition -, World Scientific. Singapore, ISBN-978-981-4603-18-8 (printed); ISBN.978-981-4603-19-5 (ebook); http://www.worldscientific.com/worldscibooks/10.1142/9167; it is also partially accessible via google books. To be noted that, by quoting WSRID20 upon checking out the shopping cart, a 20% discount will be obtained. The book is also available in kindle edition.